SCVHistory.com | News | Museum in Santa Paula Highlights 'Lessons Learned' from St. Francis Dam Disaster. California Oil Museum Highlights 'Lessons Learned' from St. Francis Dam Disaster. Exhibit Runs March 3, 2018 through July 8, 2018. California Oil Museum | February 15, 2018. Santa Paula, CA — Three minutes before midnight on March 12, 1928, the St. Francis Dam collapsed, sending 12.4 billion gallons of water downstream. The resulting flood killed over 400 people, with 103 still missing to this day. The St. Francis Dam disaster is considered the second largest disaster in California history, in terms of loss of life, and is the largest man-made disaster in the state. 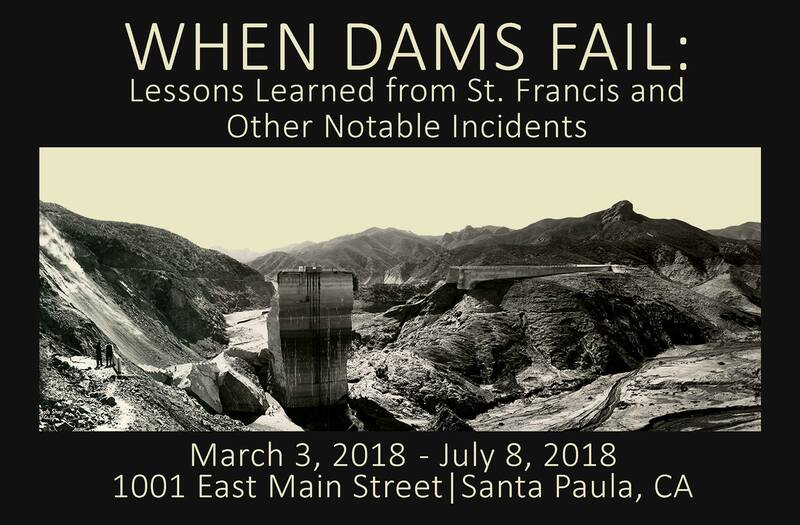 In remembrance of the 90th anniversary of the St. Francis Dam Disaster, the California Oil Museum will exhibit "When Dams Fail: Lessons Learned from St. Francis and Other Notable Incidents" from March 3, 2018 through July 8, 2018. This exhibit covers more than a century of time and provides a look into several of America's dreadful dam disasters, the impact on the lives of those affected, and the lessons learned through investigative research and retrospective evaluations. A special presentation will be given on Saturday, March 3, from 2 p.m. to 3 p.m. Archaeologist Anne Stansell will share her research findings on why the St. Francis Dam disaster has been largely forgotten on a state and national level, but tenuously remembered within the flood-zone. Seating for this special presentation is limited. The California Oil Museum is housed in the original headquarters of the Union Oil Company of California, a beautiful historical building which is listed on the National Register of Historic Places (NPS-86002619). The Museum is dedicated to enriching the lives of local citizens, county schoolchildren, and visitors from around the world, and encourages each guest to understand the significance of the petroleum industry and its California history, as well as develop an appreciation of the world of science. The California Oil Museum is located at 1001 E. Main Street in Santa Paula. The Museum is open Wednesdays through Sundays from 10:00 AM - 4:00 PM. Admittance is free, a suggested donation of $4 is appreciated. The California Oil Museum Foundation is a 501(c)(3) non-profit organization.